It always happens. I think I’ve created some new block … and then I see it in a quilt on someone’s blog. And that happened recently with the Bead on the String … though I did’t save it and am having problems finding it again … I’ll keep looking. The good news is those are happy coincidences because they usual lead to some new idea about how to use the blocks in a quilt design. Our block is similar–though constructed in a completely different way–to one in Weeks Ringle and Bill Kerr’s book, The Modern Quilt Workshop, which they call Love Bead. Look closely and you can see that in their quilt, the bead blocks (with no string) are alternated with string blocks. 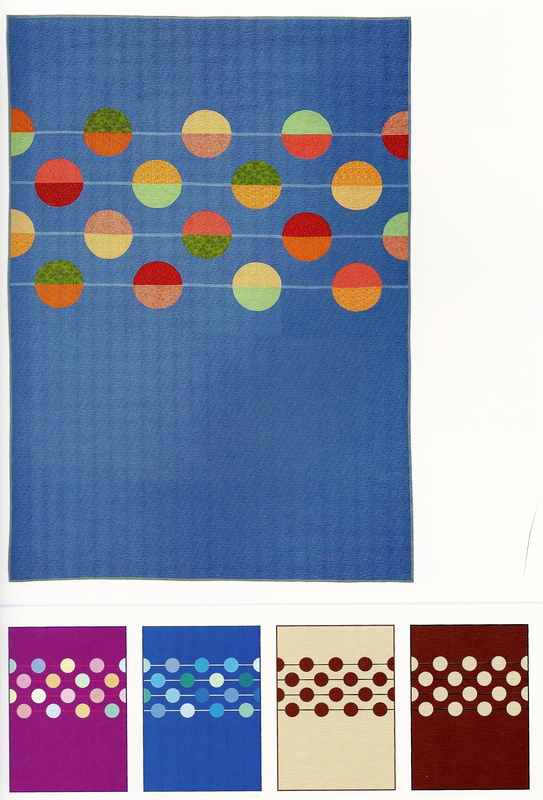 This illustration from their book shows different color options and how the bead blocks could be used in a quilt design with lots of negative space. I love those happy coincidences!! When I saw the beads, my first thought was…..
and to make them go further, put a plain string block between them. Mine were going vertical in my head though.